We have been informed by Paul Schrade that Rose Lynn Mangan passed away in late February of this year. Many people probably do not know who she was, for the simple reason that she was a person who worked mostly behind the scenes. Off and on, she had been the chief researcher for Sirhan Sirhan’s defense team for many years. No one had spent as much time looking at the evidence in the RFK case than she did. Mangan lived in Carson City, Nevada, so it was not that far for her to drive to the Sacramento State Archives where much of the surviving evidence in the Robert Kennedy assassination was maintained. If one studies the RFK assassination, which unfortunately not very many people do, one can see how Mangan fit into the historical backdrop on that case. At the start, very few people had any inclination or intuition that the Robert Kennedy case was anything but what it appeared. A young man, apparently in a fit of rage, jumps forward out of a crowd in the pantry of the Ambassador Hotel. He then fires at the person who, most people thought, was going to be the next president. Everyone’s eye is drawn to this young man as Bobby Kennedy sinks to the floor. Sirhan is immediately apprehended and taken to the police station. No one who was alive then can forget the next day’s death announcement by Frank Mankiewicz. Then there was William Harper. Harper was a well-respected criminalist who worked for, among other departments, the Pasadena police. He had a serious problem with the RFK case from the start. The reason being that he had a professional dispute with the LAPD’s chief criminalist DeWayne Wolfer. Being familiar with the shoddiness of Wolfer’s work, he had warned Sirhan’s defense lawyer Grant Cooper not to accept any of Wolfer’s findings at face value. (ibid, p. 556) Cooper did not pay heed to this well-founded warning. He actually did the opposite. He agreed to stipulate to Wolfer’s forensic findings concerning the ballistics evidence. To say the least, this had disastrous results for Cooper’s client Sirhan Sirhan. For now the trial of Sirhan became not about the guilt or innocence of the defendant; it was about Sirhan’s mental state at the time of the shooting. Because of Cooper’s blunder, Sirhan was condemned to death. But due to a later California Supreme Court decision, this was altered to life in prison. Two things happened after Sirhan’s trial that changed some people’s perceptions about the RFK case. Art Kunkin, the publisher of the LA Free Press, ran a story by one of the very few people who had studied the actual ballistics evidence in the pantry of the Ambassador Hotel. Lillian Castellano had analyzed the bullet evidence in the case, and she came to the conclusion that Sirhan could not have been responsible for all the projectiles that had been fired that night. Especially in light of the fact that hotel maître-d’, Karl Uecker, said that he went for Sirhan’s gun after he fired the first shot and had it controlled, at the most, after the second shot. Besides Kennedy, there were five other people shot, one of them twice. RFK was shot four times. The maximum number of bullets Sirhan’s gun could hold was eight. Castellano’s article began to cast doubt on LAPD’s honesty in building its case against Sirhan. Inversely, it indicated just how inept his defense had been. Mangan served as Sirhan’s researcher from 1969-74. Then, at Sirhan’s request, she returned in 1992. In 1996 she made a memorable appearance at the civil trial of Scott Enyart vs. LAPD. As mentioned previously, Enyart was a high school photographer who was in the pantry at the Ambassador Hotel when RFK was shot. He kept on snapping photos during the firing sequence. But as he left the scene he was accosted by the police and told to turn over all of his film. Once he did, the police said they would develop the film because they needed it for the upcoming criminal trial. That statement turned out to be false, since they did not use the evidence at Sirhan’s trial. (Ibid, pp. 619-20) But when the trial was over, Enyart asked for his pictures back. He got back less than twenty per cent of them—and no negatives. He was then told that the rest would now remain secret and be archived for twenty years. Enyart waited for almost 20 years. In 1988 the LAPD told him that his photos were now in the state archives in Sacramento. But when Scott wrote to Sacramento, the archivist told him they were not there. He concluded that they were gone, part of the many photos incinerated by LAPD in 1968. But since the police had always maintained that the destroyed pictures were duplicates, Scott maintained that his photos must still exist. And he wanted the originals returned to him. Since he was up on a steam table during the shooting, his photos would have significant monetary value. At the trial, Mangan exposed another layer of perfidy in the RFK evidentiary record. The police needed to explain why and how the photos suddenly appeared out of the blue, after seemingly being lost for decades. The police tried to explain this all as a mistake in record keeping. The photos had been misfiled under another person’s name on the wrong list. By diligently crosschecking the lists, they were rediscovered. If not for the theft from the courier, all would have been explained satisfactorily. Scott needed someone with expansive and intimate knowledge of the files at the state archives. No one was better qualified than Mangan. Clearly, the plaintiffs were unaware of who she was and were unprepared for her testimony. Mangan completely negated this LAPD cover story. Since she was familiar with all the evidence filings across all the categories, she knew that LAPD was playing a shell game. They had played around with their own property list to create a file that was not really in the Sacramento archives, under a name that was not at all related to Scott Enyart’s. (Probe Magazine, January-February 1997, p. 8) No one else could have supplied that crucial information, which helped Enyart win a jury verdict. Her testimony also indicated that the heist of the photos from the car was most likely an elaborate ruse. This is how deeply embedded the RFK cover up is inside the LAPD. But on her visit to Mangan, Pease was shown still another level of deception in the RFK case. Recall what Harper told Mangan: They switched the guns. They switched the bullets. And recall what Mangan said about Harper’s reliability: his information always checked out. Patrick Garland was the evidence master for the Wenke Panel proceedings. In that examination, the Kennedy neck bullet, #47, bore the markings ‘DWTN’ on its base. The Goldstein/victim bullet, #52, bore only a ‘6’. But these were not the original markings. Number 47 should have had a ‘TN31’ on its base. Number 52 should have had only an ‘X’. In other words, this evidence clearly indicates that someone switched the bullets, and then made the phony photograph. Besides the inherent fraud in the false comparison, this also clearly implies that Wolfer could not get a match from the gun in evidence. 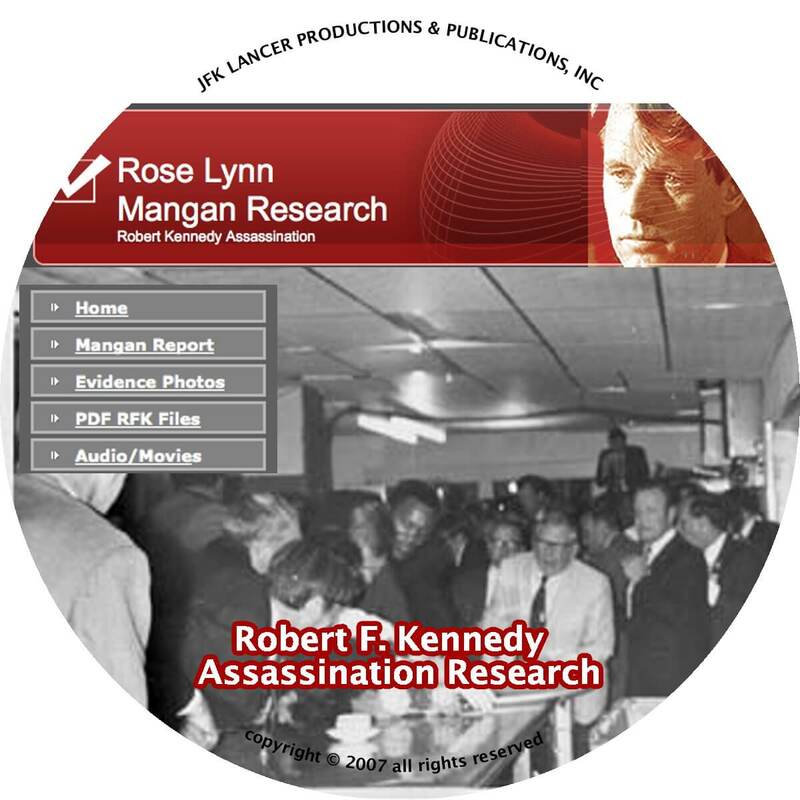 At the time of her passing, Mangan had a book contract with JFK Lancer about her life as Sirhan's Researcher, to be published in June, 2018. It was to be based upon the extensive files she had accumulated over the decades she had worked on the RFK case and visited the Sacramento Archives. Lancer is going forward with its publication in a revised format. Debra Conway will also be visiting Carson City to collect the Mangan files; her archives will be preserved, scanned and will be made available online along with the publication. While we await her complete files to be deposited online, anyone interested in the Bobby Kennedy case should visit her web site, which is still being maintained. 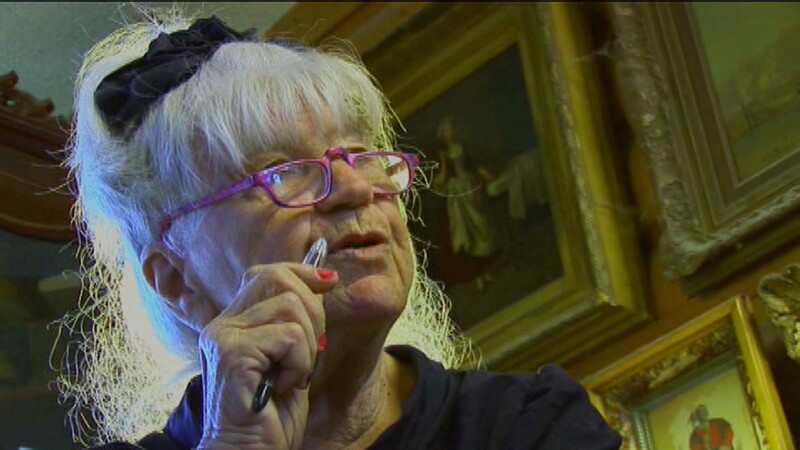 We all owe Rose Lynn Mangan a salute upon her passing. She worked the primary evidence in the RFK case like no one else did.